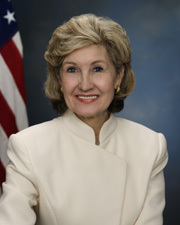 HUTCHISON, Kathryn Ann Bailey (Kay), a Senator from Texas; born in Galveston, Tex., July 22, 1943; attended the public schools in La Marque, Tex., graduated, University of Texas at Austin; graduated, University of Texas School of Law 1967; television reporter; member, Texas house of representatives 1972-1976; vice-chair, National Transportation Safety Board 1976-1978; bank executive and general counsel; businesswoman; unsuccessful Republican candidate for election to the House of Representatives 1982; Texas state treasurer 1990-1993; temporary co-chair, Republican National Convention 1992; elected as a Republican to the United States Senate in June 5, 1993, special election to fill the remainder of the term ending January 3, 1995, left vacant by the resignation of Lloyd M. Bentsen, Jr.; began service on June 14, 1993; reelected in 1994, 2000, and again in 2006, and served from June 14, 1993, to January 3, 2013; Republican Conference vice-chair (2000-2007); Republican Policy Committee chair (2007-2009); deputy permanent chair, Republican National Convention 2004; was not a candidate for reelection to the Senate in 2012. Kathryn Ann Kay Bailey Hutchison, in Women in Congress, 1917-2006. Prepared under the direction of the Committee on House Administration by the Office of History & Preservation, U.S. House of Representatives. Washington, D.C.: Government Printing Office, 2006.